25-Jan-2015 -- This is the 5th out of 6 reports, describing confluence visits in Bosnia/Herzegovina, Croatia and Hungary. The story starts at 45°N 16°E. Coming from 45°N 19°E, I approached this confluence via the town Szentlörinc and the village Királyegyháza. Based on my research on maps I would be able to drive to the exact confluence point since there was a track heading due west from Királyegyháza. In reality, this track proved to be impassable by car and even on foot. This rainy January was most likely not the optimal season for such a confluence visit. Nevertheless I parked my vehicle at the outskirts of Királyegyháza and set off on foot. After crossing the railway line and passing a wayside cross I approached the vicinity of the confluence where 'road' conditions became even worse. The closer I came, the muddier the terrain became. 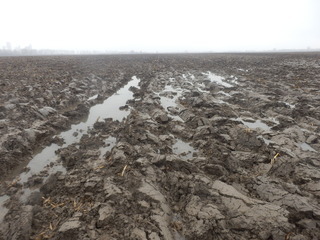 For the last 130 m I had to cross over a totally water soaked ploughed field. I had to jump over huge puddles – the only problem was that I wasn't able to jump, because I had 10 kg of mud sticking on my boots. At some point I almost lost my boots in the mud. The whole situation was so bad that it actually turned out to become a funny adventure at some point. Nonetheless, I made it to the exact confluence point. In contrast to the previous visit in 2006, the trees at the confluence are now entirely gone. There is nothing else other than fields in all directions. Vegetation: none (at the time of the visit). The story finishes at 46°N 17°E.